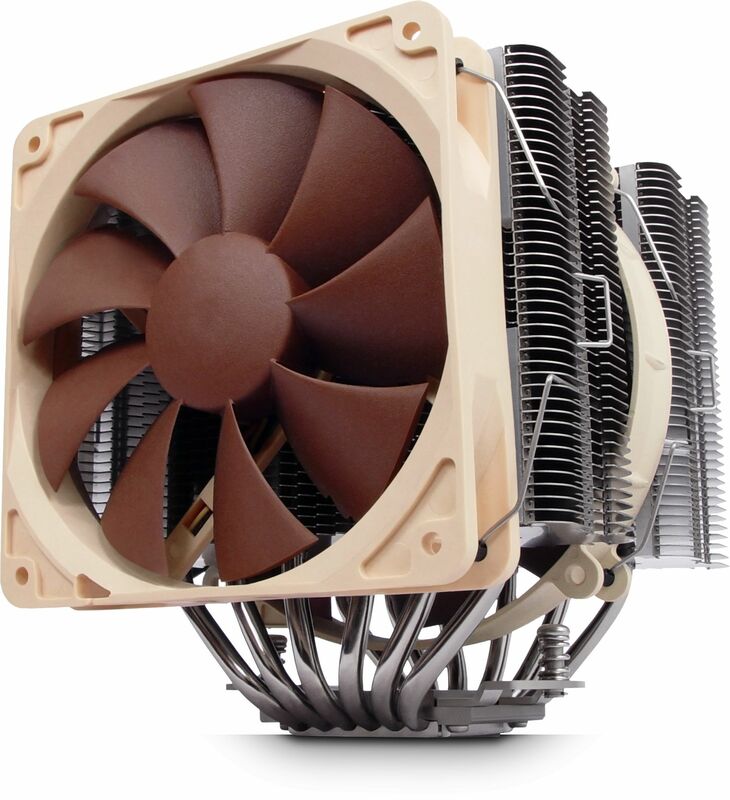 As well as combining two high performance Noctua fans, the NH-D14 is topped off with a tube of Noctua's award-winning NT-H1 thermal compound as well as the new SecuFirm2 multi-socket mounting system, the NH-D14 is an elite choice for the highest demands in premium quality quiet cooling. 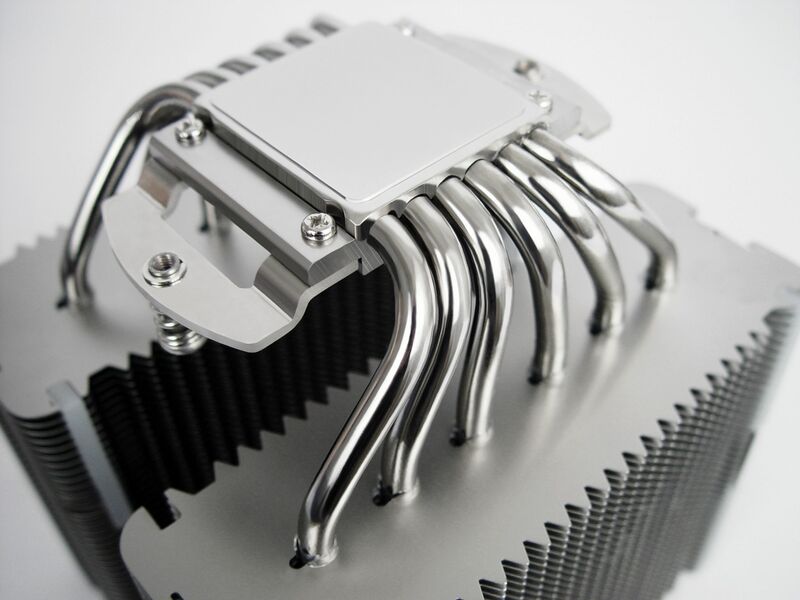 Providing more surface area, better heat-distribution and superior airflow efficiency than conventional tower style heatsinks, the NH-D14s six heatpipe dual radiator design was developed to provide ultimate quiet cooling performance in dual fan mode. The NH-D14 sports a premium quality dual fan setup consisting of Noctua's award-winning NF-P12 (120mm) and NF-P14 (140mm) fans, both of which feature Vortex-Control Notches, SCD technology and SSO-Bearings in order to achieve a perfect balance of performance and quietness. An asymmetrical design that gives more clearance above the RAM slots (44mm) which ensures good compatibility despite the cooler's size. The NF-P12 fan can be moved upwards or left off in order to further improve compatibility. Hanging out at the bottom of the fin-stacks, the NF-P14 fan doesn't only contribute to the NH-D14s superb CPU cooling capabilities but also provides massive airflow over surrounding motherboard components and heatsinks, thus ensuring excellent component cooling performance. 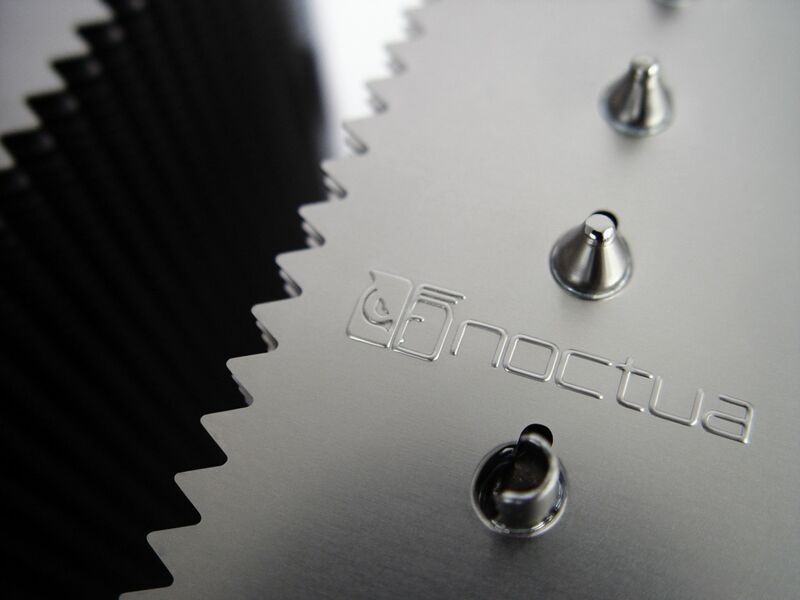 Noctua's enthusiast grade SecuFirm2 multi-socket mounting provides broad socket compatibility (LGA1366, LGA1155/6, LGA775, AM2, AM2+ and AM3) and meets the highest demands in safety, contact pressure and ease-of-use. I have had this for about a week now and it is excellent. I upgraded to an i7 4770K with this fan and I can get 4.6 gig on air with idle temps of less than 30 degrees C and load temps of mid 50's at most. This is with the ultra low noise adapters. My NAS and central heating is noisier now so very happy! It is a monster though so make sure your case is big enough! Pros: good/secure fittings (far, far better than AMD stock); very quiet; superb cooling if your case has decent airflow; price/performance excellent. Cons: bulk can make fixing slightly awkward, and access to memory slots on most motherboards is compromised; (needs low profile memory for slot nearest cpu); Needs a large/wide case. This is a long term test, having had this since Dec 2010 on my PhenomII/1090T - and it copes effortlessly with overclocks, (this is in default config of 1x120mm and 1x140mm fan). E.g. on a Sabretooth 990FX/2.0 board I run my 1090T stably at over 4GHz (3.2GHz stock) and a I've seen it reach 41C once during a gaming session - 30 minutes of MP4 generation (using all six cores) had it to the giddy heights of 43C, and it dropped below 40C pretty quickly after the MP4's were done, (ambient around 21C). Normally this sits at about 12-15C over ambient - so it's a cool customer. Thumbs up also for Noctua and QuietPC support - both were very helpful when I had pre-purchase questions. Would I recommend this? Yes, providing you've got a wide enough case to accommodate it - although it fits nicely into my Coolermaster HAF932. Very efficient cooler-case needs to be 20+cm wide. Really good product, I get 28c idle and 35-37c load. Simple installation. 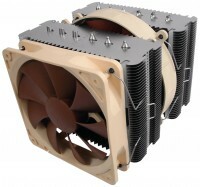 Well done Noctua. I can recommend also Quietpc itself, quick precise service. 100% satisfied. Cooler Master Storm Sniper, Asus Crosshair III formula, AMD Phenom IIX4 965 B, 8gb DDRIII, 2X2TB 10000rpm HDD, RAID 0. Make no mistake, this CPU cooler is a big beast but it is also absolutely amazing. I run a quad core, 4GB RAM, 1 GB ATI graphics, 320 GB Raptor primary and 4 x 1 TB RAID, all in a fairly warm study so my rig generates a fair amount of heat. Previously whilst doing some very processor intensive video rendering (all 4 cores maxed), the CPU hit 75C - which prompted me to look for a better CPU cooler. After installing this monster it barely hit 35C performing exactly the same task and it runs at 27C when idle. The 2 fans are pretty quiet and ensure that all that vented heat is dispelled from the case so sys temp is unaffected. Make sure it will fit before buying but if it will, don't hesitate. Fantastic product. Fantastic service. Just installed and tested all day with a phenom II 940 @ 3.8ghz , cpu @ 1.44v, cpu-nb @ 1.325, ambient temps 23c, idle 32c, load 42c. I like this monster a lot.